Next week we have a group of teachers coming in to learn some new skills they can integrate into their classes next year. I’ll be teaching a blended session on using the Hummingbird. It’s a great way to introduce and combine making, robotics, and coding. Putting the pieces together is pretty simple – no wire stripping, no resisters, no soldering. The one big drawback is the price of the kit. But if you take good care of it and keep up with the pieces, it can last a long time. I made this simple worksheet to guide the teachers through testing out how to connect and code each of the inputs and outputs. They will have already had a session on coding with Scratch. After working through this worksheet the teachers will spend the rest of the day creating interactive constructions using the Hummingbird. Make sure that you have both offline Scratch and the Hummingbird Server installed on your laptop. Watch the two videos at the beginning of pages linked above. They will explain how to connect the inputs and outputs to the Hummingbird and connect the Hummingbird to the Scratch extension with Hummingbird programming blocks. When programming the following outputs and inputs, make sure that you are indicating which port you are sending the code to. The Hummingbird LEDs and motors are output devices. 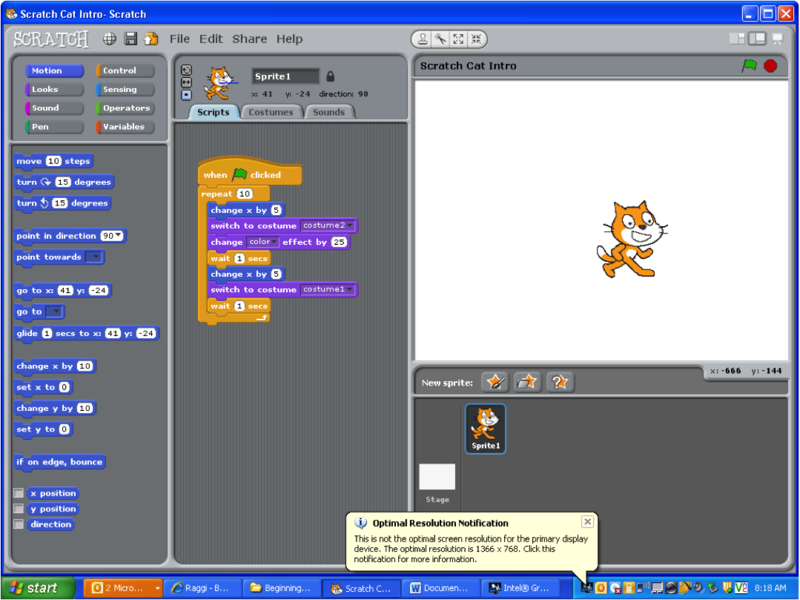 By writing programs (scripts) in Scratch you can send commands to these devices to make different things happen. You might cause a motor to vibrate or turn. You may cause lights to blink on and off. You may also turn text into a voice. Follow the step-by step instructions on one of the websites linked above to attach and program LEDs (light emitting diodes) using Scratch. Light up several LEDs and change the light intensity. Learn to turn them on and off. If the LEDs do not light up check your connections. Check your code. Check your power. Follow the step-by-step instructions to make the RGB (Red-Green-Blue) LED light up in different colors. Use this chart to control the colors. Vibration Motor – The shaft of this tiny motor is weighted more on one side of the shaft than the other. This causes it to vibrate back and forth when it rotates. Attache a feather or a curly pipecleaner to have some fun. Servo Motor – A servo motor is a motor that moves to a particular angle. The Hummingbird servo motor can rotate to any angle from 0° to 180°. Consider using this motor mounted at different angles to close a door, wave a sign, or flap a wing. Use your imagination. Gear Motors – This motor can make complete 360 degree turns clockwise as well as counter clockwise by using whole numbers between -100 and 100. How could you include this in your construction? A Merry-go-round? A revolving planet? The Speak block converts text to speech. The voice has tht digital sound, but most words can be understood. In you code, remember to use a Wait block after the Speak block. The Hummingbird sensors are input devices. They collect information from the environment and send the information to the Scratch program where it it used to make a decision or control an output device. You can create a threshold or a range of date which will trigger a result by using If-Then statements. For instance, it the level of sound is over a certain threshold, the Speak block may be programmed to say, “It’s too noisy in here,” the Servo motor may raise a sign that says, “Shh!” and the LEDs may light up. The distance sensor measures the distance to the closest object in centimeters. It can detect distance between about 8 cm and 100 cm. The Sound Sensor measures the level of sound on a scale of 1 to 100. The Temperature Sensor detects the temperature in Celsius. There is also a light sensor and a tilt sensor, but we do not have these in our kit. Anyway, I just discovered a YouTube playlist chock full of videos to help you understand the many mysteries and fine points of programming in Scratch. Fire up your computer and go to http://www.youtube.com/playlist?list=PL9ngVLPWKfDmKcvbZUVePC1sN3C6OTZ5_ and get ready for the fun to begin. This is the first lesson I give to classes learning Scratch. After giving a tour of the Scratch interface, I ask them to start building this script with me. In doing so, they get a quick demonstration of creating new costumes, the importance of positive and negative variables, the existence of the x/y grid, and timing. After building the first part of the script, I ask them to complete it by making the cat turn in the opposite direction and “walk” back across the stage. How can you make the Sprite turn around and walk back across the screen? Write your thoughts about this below. Then try to accomplish the task. Write about your results, even if you were not successful. We learn from trying. Each version of the task is called an iteration. Experiment with the blocks below. Write what you learned about making Sprite move. Write what you learned about changing the way a Sprite looks. 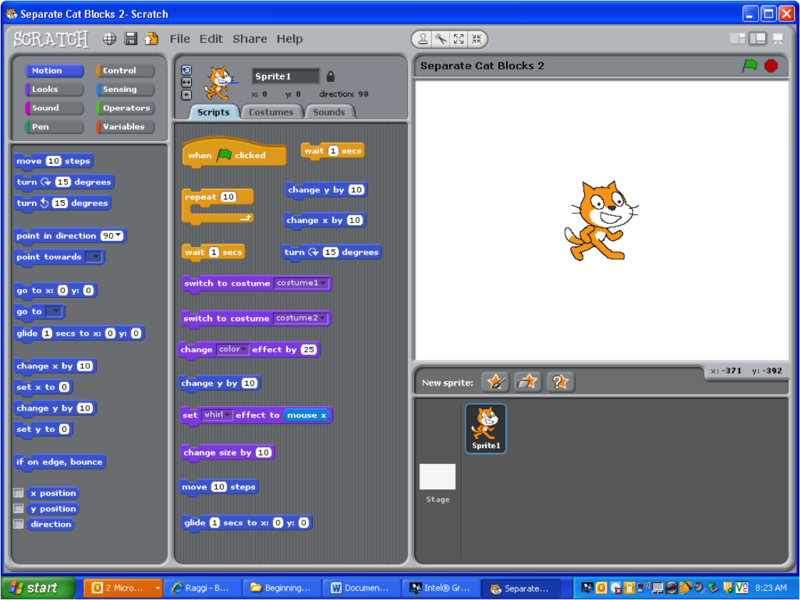 This is a collection of Scratch resources. 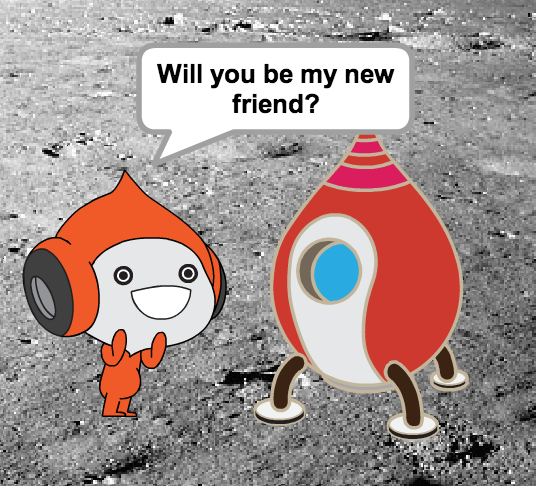 I have them posted on our Scratch wiki so that the students can access them. This works especially well for our Scratch Club because the students are at all different levels of competency in using Scratch. They learn from me, I learn from them, they learn from each other, and they learn from the available resources. I have not required them to join the online Scratch community. Instead they are sharing on the wiki.